I've been thinking about the Yukon Gold Rush miner. You'll recall, to preserve his sourdough mother--he called her Maude, after the first girl he'd ever kissed--and caught in a Yukon white-out, miles from camp, weak from having not eaten for four days--he'd boiled the last of his dogs, King, six weeks earlier--he'd kissed Maude one last time, placed her next to his heart, curled his emaciated body around her, and lay down in the lee of a a twelve foot drift. His last thought--really a final hallucination--he was lyin' in a tub, just like the one he'd had his last bath in, seven months past, in San Francisco, the night before he'd boarded the ship, Lily Longstockings, that brought him on the first leg of this, his final journey. The woman scrubbing his back was named Shirley. For a fleeting moment he'd considered changing Maude's name to Shirley, but in the next moment he'd berated himself for being so fickle. The tub, the one in his hallucination, was foaming with sourdough starter--only his knees poked above its writhing, bubbling surface. The woman scrubbing his back this time, was...yep, Maude, but all growed up, an purty! He died a happy man. And, as we know, Maude survived --his starter, not the girl he'd kissed behind the one room school house they'd attended. She, was still in Kenosha, Wisconsin, the mother of seven children, four girls and three boys--and, rumor has it, Maude, the starter, is still alive today. I fed my (unnamed) starter yesterday. I keep two versions. Once again I had about 200g of discard. My wife asked me to make biscuits with it. On my first attempt, http://www.thefreshloaf.com/node/21536/sourdough-biscuits-trying-real-thing , I felt the dough was a little dry, could stand more autolyse time, and would benefit from baking in a hotter oven. I tweaked my original recipe. Here it is. The tweaks are in bold type. 356g (12.5 oz. ; 2 cups) sourdough starter; 100% hydration; refreshed 12 hours earlier, and left to develop in the refrigerator. I rested the dough, covered and chilled in the refrigerator, for 45 minutes. I turned the ball out onto an unfloured dough board, and rolled it to about 1 inch thick, folded the dough in half, and rolled it out again. I repeated this three times more. Each time I rolled it out the dough got more flexible, and felt less dry. I was glad I hadn't added additonal liquid. On the final roll-out I went to 1/2 inch thick, cut out 10, 2-5/8 in. biscuits, arranged them on a Silpat pad lined half-sheet pan, covered them with a dry tea towel, and put them into the proofing box (76°F). Baked in a 425°F oven for 15 minutes (light golden brown). They more than doubled with oven spring. Lifting the first one to the cooling rack I knew, from its light feel, I had a success. Reducing the flour amount slighty; caressing the dough, not mauling it; increasing the post-mix rest (autolyse?) three-fold, and baking at a hotter temperaure each contibuted to a lighter, tastier biscuit. I don't see a need to tweak further. I've named this recipe: Biscuts ala Cookie. Truth is however, with my relience on chilled, shortening and dough, I've moved further away from "the real thing". That said, I'm sticking with this one. If Cookie had had a refrigerator/freezer he would have used them. 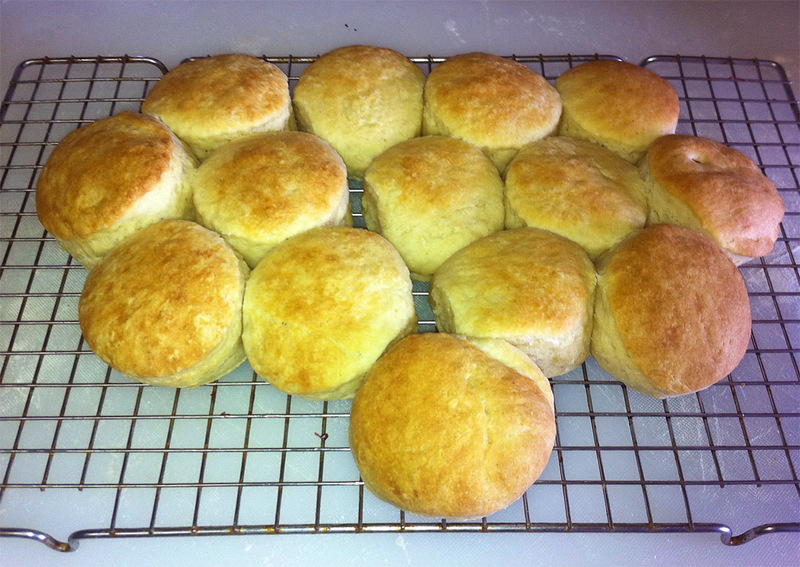 I've recently developed a new starter, and along with bread bakings decided to give it a try in Biscuits ala Cookie. I followed my recipe to the letter with three exceptions in procedures. I developed the levain and rested the dough (autolyse) at room temperature, and I hand-mixed the flour and butter/lard mixture into a finer mixture: sunflower-seed-sized bits. This resulted in less layering than in the earlier tries. as soon as I get a starter going again. Last one didn't make it, think it was too hot for it. Or maybe I got too occupied with other things and forgot it! Cant' do that! I wonder what flour you are using to build your levain. 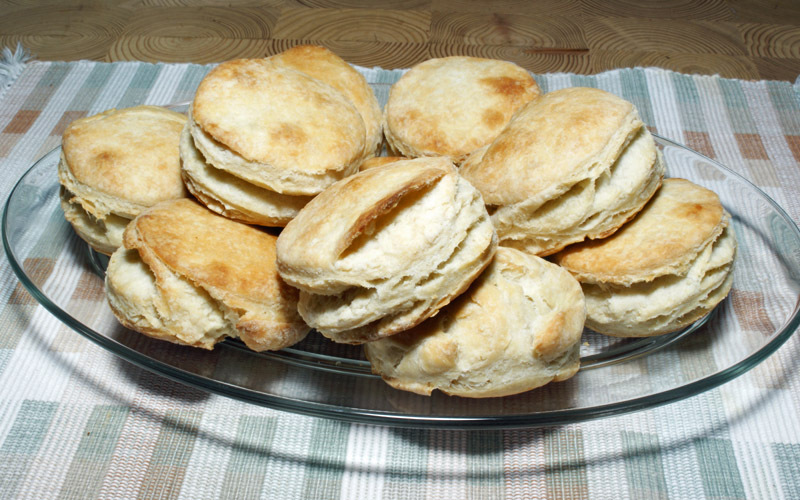 Biscuits, being a low gluten product, would probably be best done with AP flour for everything. And I don't know what the overall effect would be if you went to a higher hydration levain but it would perhaps allow you to fold the dry ingredients into the very wet levain and with a fair amount of time for autolyse further decrease the need to knead. The balance would seem to be that you get enough gluten to hold the gas during the proofing period but not enough to keep it from rising or make the biscuits tough. I don't think that the vodka pie dough trick of using ethanol for part of the liquid to avoid gluten formation would work here as it might suppress the yeast growth more than you want. I do think that you have struck a nice balance between layering and mixing. "Cookie" was probably always rushed, and had to take whatever flour he could get, so the key to survival was flexibility. Have you come across any mention of how much sourdough/levain was common to have on hand in a trail camp? Try one and two were made with a levain that had been fed with first clear flour for about two years, and whose levaining power was declining slowly--a situation you and Debra have commented on: a seed starter that, despite poor maintenance, is still working after a fashion. I'd been watching it fail, but didn't know quite what to do to save it. 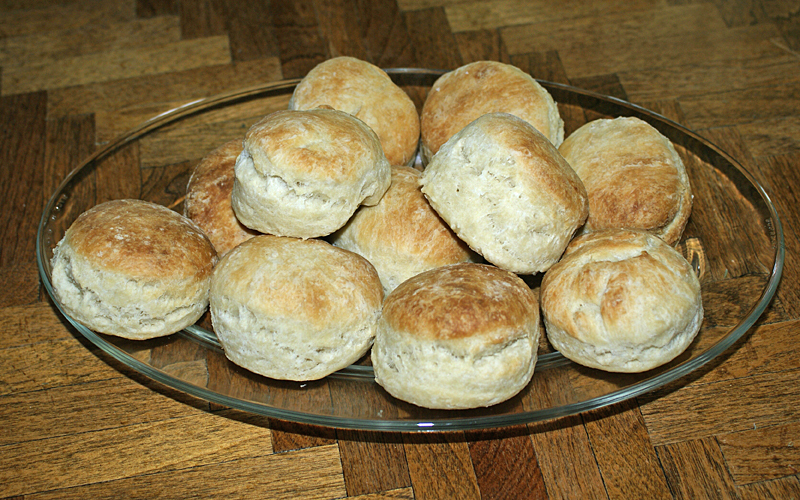 The recent biscuits were baked with a new starter, fed with KA bread flour. KA all-purpose flour was used in the biscuit dough each time I've baked them (5 times); the original recipe and its minor tweeks are reported in the three postings you've read. Your starter is clearly robust when fed clear flour. Can you describe your habit (out time, refrigerated time, refresh ratios, hydration, number of refreshes before you put it back in the cooler)? And what is the behavior that you observe that leads you to conclude that it was declining (other than just slow proofing)? I have adopted a twice a day refresh cycle that stays on the counter in capped 5 oz poly cups that I reuse. Room temperature this time of year is 24°C and the refresh is 2:20:20 (grams) and it about triples in 12 hrs. When I need starter to bake with on the following day I can easily make 500g overnight by using the ~30g of residual (after taking out 2g for the refresh) and adding 240g of water and 240g of high gluten flour. If I want to mix first thing in the AM I put the bowl over the refrigerator; if I want to mix around noon I just leave it on the counter. I have also found that over a modest range of temperatures (~19°C to 26°C) Gaenzle's model for growth rates is dead on if you allow one generation time for lag phase. Recall, it was the starter that was failing that was fed, for a long time, with first clear flour. It is my new starter I'm feeding exclusively with Bread flour. I discarded the old starter. Had I asked Debra for help earlier, I might have saved it, but I initiated a new, purchased, dry starter instead. When initiation of the new starter appeared to fail I asked for help; with Debra's guidance the new starter was saved, and is working wonderfully. I'm maintaining the new starter differently than I did the old. Old starter maintenance: I kept 150g of 100% hydrated seed starter in the refrigerator. Once, each week to ten days I retained 50g of the seed starter, refreshed it with 50g each of First clear flour and water, and left it at room temperature only until I observed expansion; then I would return it to the refrigerator. Most of the time, on the day after refreshing the seed starter, I'd remove some for whatever formula I was planning to bake the next day and build its levain in the three-build method I describe in http://www.thefreshloaf.com/node/12766/building-formulaready-levain-starter . I never use more than 20g of seed starter, usually less. I was seeing two changes in my old starter. It's levaining power, observed in proofing times and oven spring, seemed to be weakening. Secondly, after refreshing (I think a couple of times, I didn't keep note.) with a newly purchased bag of First clear flour the resulting ripened mixture smelled like spackling paste, and its gluten structure was destroyed in 24 hours. The mix became very runny. This seed starter and levain building approach has served me well for about two years. I've changed my seed starter maintenance method, but will continue to build levain the same way. Let me be the first to say there are other, and perhaps better and/or easier ways to develop levain. I'm not advocating others use my approach. It works consistently for me. I've never had a bake fail due to the levain in those two years. New Starter Maintenance. This approach was recommended by Debra Wink, and I've been following it for only two weeks. Each time (usually weekly) when I build levain I make enough extra to completely replace my seed starter. I refresh 20g of the ripe levain 1:1:1 and immediately put the resulting 60g mix in the refrigerator. This becomes my seed starter for the next levain build. I've used it three times maintained this way with with equal success each time. I'm familiar with the yeast and bacteria growth curves you quoted. I have a copy of the paper describing the computer model Michael Gaenzle built and reported. I only use it as a guide for DDT and proofing temperatures, which is, of course, only yeast related. I don't want my bread baking to emulate my two careers wherein mathmatics played a big role. I want to understand its science only sufficiently to make baking more fun, less frustrating. The TFL in general, and Ms. Wink specifically have been my best source. After re-reading your exchange with DW (I had missed the fact that you had discarded the old starter) and now understanding your focus on the yeast side of the equation, I think I am beginning to understand where you are coming from. So as long as you stay below 27°C I think you are on firm ground for elaboration and proofing. On the other end of the scale (refrigeration for a relatively long time) it is probably important (though perhaps impossible) to keep the storage leaven cold enough to have insignificant growth rates of both LAB and yeast during your 14 to 21 days in the refrigerator. There is some temperature at the low end of the scale where the ratio of LAB growth rate to yeast growth rate is maximized, but since Gaenzle used a curve fitting approach to picking his model parameters, the validity of his models for identifying a specific temperature at which the ratio is maximized is questionable. Below 4°C might be OK though 2°C would probably be better for storage though you might want to rethink the 1:1:1 feeding just before refrigeration. If Gaenzle is close, even at 2°C the LAB will increase by about 600X and the yeast by 5X over 20 days (480 hrs) of exponential growth (which they can't do because you are not providing enough food for that to happen) so by the time you get ready to make a new levain your refrigerated mother is at least starving if not pretty depleted in live population density. And if Gaenzle is wrong by a factor of 4 you are still on the edge for the yeast and well beyond it for the LAB (which you actually do need to maintain the low pH that suppresses the opportunistic bacteria even if you don't demand the acid for flavor). You might try a split with one leg fed at 1:20:20 and the other fed at 1:1:1 before refrigeration. A couple of months (four - two week refresh cycles) should be enough to tell you whether there is any difference. You don't have to bake with the first leg, just do the levain build and put it back in storage after another 1:20:20 refresh. Though since the yeast won't be ripe if fed at 1:20:20 and grown two weeks at 2°C, you may want to let it get bubbly before initiating the levain build - the down side is that you further deplete the LAB when you warm them up without food, but so long as there are any at all they will survive and grow, mostly during the cold cycle (assuming that they are not replaced by a more acid tolerant strain). I think I understand your rationale for migrating the hydration level step-wise from the 100% of the refrigerated culture to the formula-specified level, and it clearly produces a beautiful result, so I am going to try it and see if I detect any difference. Since I maintain at 100% hydration, and mix at 75%, it is not much of a stretch, but if it will move me toward your results I would be happy. I know you got the idea that I refresh my refrigerated starter at a 2 or 3 week interval from the 3-build levain making post I wrote two years ago stating that was a goal. Subsequently, I found weekly refreshing were a better choice, and for at least a year, if not more, I've been refreshing my starter every week, or never more than a 10 day interval. I thought I made that clear in my more recent posts, including the one above answering your last question. I guess I wasn't clear enough. Following Debra Wink's starter maintenance suggestions, I will maintain my new starter by replacing it entirely with excess ripe levain, refreshed 1:1:1 and returned to the refrigerator. If I don't bake a particular week, or if I make a levain with flour other than Bread flour, I'll make just enough levain to completely replace my seed starter with ripe, refreshed. levain. I'm also only keeping 60g of seed starter now. Thanks for your suggestions, I know from your previous posts you're into deeper understanding of the sourdough science than I will ever be. Frankly, I don't want my baking hobby to emulate my working careers that involved considerable math and science. I've been retired more than a decade. I want to keep my life as simple as posssible. My foremost baking goals are, flavor, consistency, eye-appeal and fun. I'll post pics. Thanks for the blog! Thanks for the recipe! These are fantastic.